Last fall I ordered a Motobecane Boris X7 from Bikes Direct. I did an initial “first impressions” review with the promise of a follow-up review a little later down the road after we had a chance to really put some miles on it and give it an adequate review. Well that time has finally come. First off, here is a video with some thoughts. And now for the written review. Most of the miles since the initial review have been put on by my son Harrison, as well as my wife whom the bike was actually purchased for. Harrison did the six-race Frosty series this winter. We documented that series if you care to go back and read the write-ups and watch the videos. The V8 tires from Vee Tire Co. are not snow tires by any stretch of the imagination so we picked up a set of 45NRTH Vanhelga tires for the winter. Let me touch on the tires here briefly. The 60 TPI 26X4.0 version we went with is a folding tire and tubeless ready. The Vanhelga is a dual compound rubber tire which means the tread along the center is harder and more durable while the knobs on the sides are softer and more grippy. In theory this should give you a tire that wears more evenly while providing greater traction. The open pattern provides excellent traction in the snow and proved to be a very good snow tire. We did not test the Vanhelgas extensively on dirt trails, mostly because we had the set of Vee Tire V8s on standby for this purpose. The tires proved to be adequate on the dirt but the tread pattern is a little more open than desirable giving a bit rougher ride than other options. They are a vast improvement over something like the Surly Nate for traditional dirt riding but not as nice as the V8 we already had. The Vanhelga will definitely be our boot of choice for winter riding or other sloppy conditions but the V8 will be our summer sandals on the Boris. That being said, the V8 is a serious desert/dirt tire that should not be overlooked because of it’s economical price point. I would not hesitate to run a set on the Farley for desert touring. Back to the Boris itself now. The drawbacks to the bike lie pretty much where we figured they would in our initial review. The bike is very heavy due to the cheap wheel set, cranks, seat, seatpost, stem, and handlebars. One chronic issue that we have had is with the brakes. Our Boris X7 is set up with Avid BB5 mechanical brakes with Tektro brake levers. About two or three races into the Frosty series the front brake started dragging pretty heavily on the front rotor. I adjusted them. Realigned the the caliper. Adjusted and realigned again. Took it into the bike shop and had my trusted mechanic do the same as well as shortening a bolt or two that didn’t look right. The end result is that regardless of what we have done we end up with the front brake dragging again within a short time. The only thing we have been able to do to compensate for this is to loosen up the cable to open up the pads enough so they quit dragging. This makes for a softer front brake with weaker stopping power but at least it isn’t working against you anymore. I am a bit of a fan of Avid brakes. The BB7 is typically held in pretty high regard by those looking for a reliable brake for backcountry touring. I not sure if it is the Avid/Tektro combination where the failure is coming from but we will continue to play with it for now. Durability was an obvious question of concern in our initial review as well. The bike is loaded with cheap, heavy parts with few exceptions. Other than our issue with the front brake we have not had any issues or breakdowns of any kind. With a few issues of keeping things properly adjusted, Harrison had no problems through the Frosty series in which he ended up placing third overall in the B division. The toughest test came a couple weeks ago when we headed to the desert outside Moab, Utah for a three day bike packing trip. (you can read and watch the trip report here https://fatbikebrigade.com/2014/09/15/the-motobecane-boris-x7-shiny-turd-or-deal-of-the-century/) Harrison was concerned about not getting a hard enough ride in so he wanted to be “loaded up”. We were happy to oblige him. 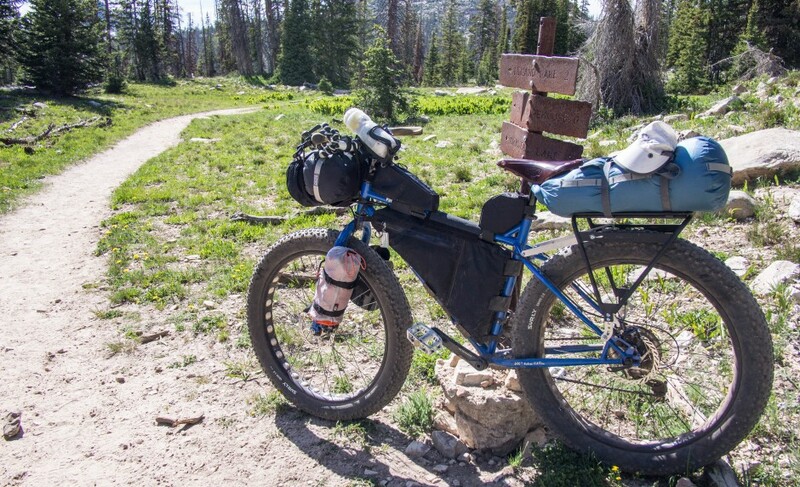 With a rear rack carrying a 4 liter Sea-to-Summit Pack Tap that I rigged a mount for as well as a loaded out pannier for the other side, drybag roll on the bars, fork rack, and a couple water bottles, we estimated his ride for the trip was tipping the scales at about 55 pounds. I can tell you it didn’t slow him down much. We rode through some pretty rough terrain that included sand, rock crawling, more water crossings than we could count, and pretty rough bomber downhill runs. Through all of it the Boris X7 kept pace and ran without issue. So what is the bottom line? The Motobecan Boris X7 has proven to be a very capable fatbike. I still do not believe that it compares to other fatbikes retailing in the $1,400-$1,600 price range. To upgrade the Boris X7 with the similar wheels, brakes, cranks, seat, seatpost, handlebars, and stem that these more expensive bikes cost would bring your cost of a Boris X7 up to if not over that $1,600 price tag. Not to mention most fatbikes out there come with tires that can at least manage both snow and dirt conditions even if they aren’t great for both. I think the Boris X7is worth the $700 price tag but don’t be fooled into thinking you are getting the deal of a lifetime with one. Overall the prices of fatbikes is coming down as more and more manufacturers are throwing their hat into the arena. As the prices are dropping the quality is coming up as well. My advice to the new fatbike consumer out there would be to spend what you can afford and don’t cheap out. What I mean by that is if you can afford to spend $1,600 look at your options in that price range and find what brand and model will suit your needs best. Talk to the folks at your local shop, you might be surprised by what they can tell you. Don’t be afraid to shop the used market either. For many out there the fatbike frenzy we are seeing is going to wane and that is where you may find the truly sweet deal. I am not upset about my Boris purchase but at the same time I wish I had spent more and ended up with a better bike. At the time that is what the budget allowed. Bottom line, do some research. Look around. There are deals to be found out there. The Motobecan Boris X7 is just not what many people, including myself, want it to be, which is a $1,600 fatbike for $700. Thank you admin. A very nice and useful review. Keep doing Good work. Hi, roughly how much was is to make this bike snow compatible? It is basically snow ride ready, though the stock tires are better for dirt than snow. It will cost you about $140 for a pair of Surly Nates, which are great snow tires. Thanks , I’m looking to join my local riders in a 30 mile river ride this winter and need a fat bike!